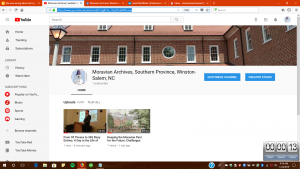 The Moravian Archives is the official repository for records of the Moravian Church in America, Southern Province. The Province includes Moravian churches and fellowships in North Carolina, Florida, Georgia, South Carolina, and Virginia. Our records begin with the establishment of the first southern Moravian settlement in 1753 at Bethabara, NC (now part of Winston-Salem), and continue until the present day. 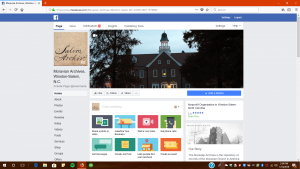 While our main function is to serve the Church in the collecting, cataloging, and safekeeping of those materials, we also make many of our holdings available for research by genealogists, academics, cultural institutions, and the general public. 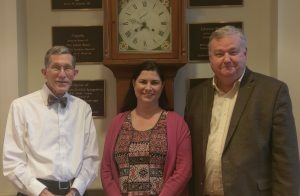 Arriving as German-speaking immigrants, building a faith-centered community at the mid-eighteenth-century American frontier, Moravians kept detailed records in order to maintain ties with Church leadership in both Bethlehem, PA, and Herrnhut, Germany. 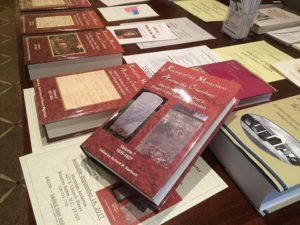 But in diaries of church and daily life, reports from missionary work with the Cherokees, and life stories of a community of church members, Moravians recorded their living witness to the surrounding world. 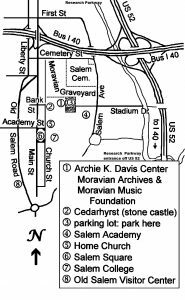 Since 2001, the Archives has been housed at the Archie K. Davis Center, a state-of-the-art facility located between the main offices of the Southern Province and God’s Acre graveyard at the northern edge of Old Salem. We invite you to browse this online guide to resources for different studies at our Archives, and to discover here a number of materials created by our staff about our church history. We also welcome the assistance of volunteer workers and financial supporters as we preserve and document a shared story with and for the greater community. Please help us continue our mission by supporting our work through a donation. Your support is greatly appreciated. Parking is in the northwest corner of the lot at the western end of SR 4326 (Rams Drive) off Salem Avenue. The same street serves as entry to the Elbertson Fine Arts Center at Salem College. Our hours are 9:30-4:30 Monday-Thursdays (excepting holidays), though by appointment only from noon-1:30pm. We will be closed to the public on Fridays for records accession work. We invite you to contact us to plan your visit.